Back in the day, Jim Vance used to double-park his cream Mercedes 450 SL outside Roland’s grocery store on Pennsylvania Avenue in Southeast D.C. He’d run in, grab a magazine, some Junior Mints, often a pack of Marlboro Reds, and dap up every soul in the store who recognized him before peeling away. This was 1979, when local TV news was king and most every American news anchor was white. The nation’s potentates and poseurs ran the country just down the street. But to black Washington, Vance was a hero, anchoring the leading local news show in the nation’s capital for more than four decades. Young’uns and old heads alike beamed with pride at his accomplishments and what he represented: an elite African-American professional, playing by his rules. “They thought he was working for them — and he was,” recalled Scott Towle. Towle was 20, stocking shelves and working as a cashier at Roland’s in 1979. Today, he is another Washingtonian who felt as if he lost a family member when NBC’s WRC-TV announced Vance had died of cancer Saturday morning — just two months after he told viewers about his diagnosis. “He became the embodiment of black Washington,” said his widow, Kathy McCampbell Vance, whom Vance often credited with saving him from cocaine addiction in the mid-1980s. They were married in 1987. Through separations and an on-and-off-again courtship, she’d been his closest companion for 40 years. If Birth of the Cool belonged to Miles Davis, Vance was the Continuum of Cool. He read the news with a jazzy syncopation, enunciating every sentence just so. In television, a world of harried producers and directors, he moved at the speed of … Jim Vance. If time hadn’t stood still for him, at least the 6 and 11 o’clock newscasts did. 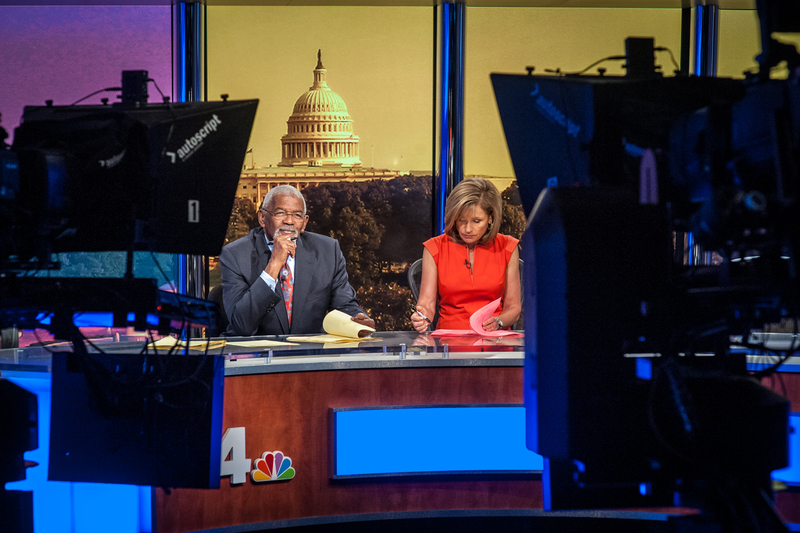 Jim Vance (left) and Doreen Gentzler prepare to return to the live broadcast after a commercial break. I met him in 2005 through sportscaster George Michael, who invited me to be a panelist on his NBC Washington sports shows. Vance was an unabashed local sports fan who formed a close relationship with Hall of Fame NFL coach Joe Gibbs and many of the team’s best players during Washington’s three Super Bowl victories between 1983 and 1992. He pined for the day when the Wizards would hoist the NBA trophy like Wes Unseld’s Bullets did in 1978. Vance was always curious what Gilbert Arenas was really like, why Stephen Strasburg always looked so angry for a man paid millions to play a child’s game and why Dan Snyder kept getting in his own way, “because Lord knows I know what that’s about,” he told me. Vance grew up in Ardmore, a suburb of Philadelphia. His father, James Howard Vance Jr., drank heavily, dying of cirrhosis when Jim was 9. His mother left him in the care of his grandparents. He blamed his father’s death on himself, once lamenting, “I was convinced I was such a piece of s— that he’d rather die than hang out with me.” He earned a degree in secondary education from Cheyney University, a historically black college where he roomed with Ed Bradley, the longtime 60 Minutes correspondent. He taught high school English for three years and got a job as a television reporter in Philadelphia through a career placement agency in 1968. With America’s racial cauldron boiling, he was recruited to Washington within a year. By 1972, he would become NBC4’s lead news anchor for much of the next five decades. Winner of 19 Emmy Awards, Vance went to Vietnam. To South Africa. And to Southeast D.C. He fished with President George H.W. Bush. Former D.C. Mayor Marion Barry sought out Vance first after being arrested in 1990 for smoking crack cocaine. Vance knew where the mayor had been, because he once put himself through the same hell. He entered the Betty Ford Center in 1984 after many years of free-basing cocaine. But he relapsed upon returning to town. “This was the pre-crack cocaine era,” Kathy Vance said. “I just think free-basing was so seductive to Vance that it just pulled him in.” At his lowest, Vance stuck the shotgun he used for bird hunting in his mouth one evening out by Great Falls, but he didn’t pull the trigger. Vance’s sobriety from cocaine, which began in 1985, lasted until he died. He became active in Washington 12-step groups, partnering with longtime advocate and D.C. politico Johnny Allem in 1991 to open the Cardozo Club at 14th and V streets, which catered to some of the city’s poorest in need of a recovery group, and the nonprofit Columbia Recovery Center. By 1989, he had combined forces with Doreen Gentzler, weatherman Bob Ryan and Michael. Ratings soared. More people in Washington watched NBC4 for the next 20-plus years than all the national cable news networks combined. 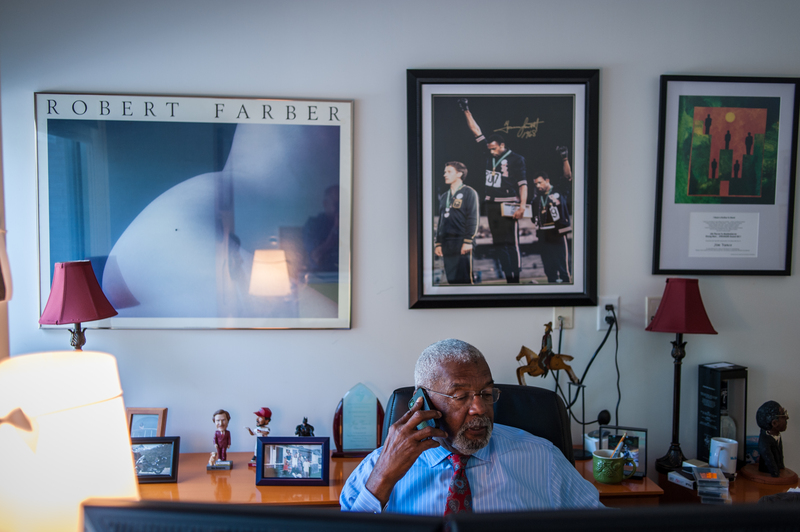 Jim Vance takes a phone call in his office. Gunner of Harley-Davidsons, slayer of hundreds of king and sockeye salmon each summer outside of Ketchikan, Alaska, connoisseur of tequila, jazz and the good life, Vance began wearing a golden hoop earring in his left ear in 2006 after the death of his friend Bradley, who had worn one. “He was such a … man,” said Rock Newman, host of The Rock Newman Show and the former boxing manager for Riddick Bowe. “He was such a cool character. Sinatra-like. When he did my show, he walked in with some beautiful sweater, leather coat over it and jeans on. That’s some cool s—. He also wasn’t afraid to be polarizing. Vance emotionally advocated for Washington’s NFL team to change its name in 2013 in his Vance’s Views forum — even though the team had a business partnership with the station that had dated back decades. Donnie Simpson, the District’s DJ for life, moved from Detroit to Washington 40 years ago. His first radio gig in D.C. was housed in the same building as NBC4. “I’m fairly nervous, to say the least,” Melvin said. “I get there early because it’s Jim Vance. But there’s no steakhouse. Just an interesting-looking building with an awning.” A brawny doorman brought Melvin to a private room. Kathy Vance knew the deal. “He had his flaws, his demons, and they were his undoing,” she said. “But on the other side of that he lived the life he wanted, and he left a lot of good behind. The irony is Jim Vance didn’t know who he was until much later in life. And even when he found out, he still perplexed the ones he loved. “I think I’ll be asking questions for decades to come about who he really was,” Kathy said. Jim Vance was 75 years old. He is survived by Kathy, three children from two previous marriages, a daughter-in-law, three grandchildren and everyone who ever saw him grace the television of their family room.